Last month I saw this nudibranch on Bainbridge Island’s Rockaway Beach: the low tides are returning during daylight hours. 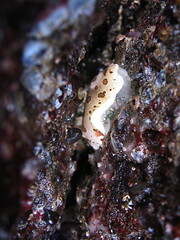 One of my goals for 2008 beachcombing was to find my first wild sea slug. Later I was told by a nudibranch expert I know that this creature is usually found subtidal. The sea slug captured the afternoon sunlight with its translucent body, appearing almost ethereal. When I returned two days later, it looked as if the creature had been eaten, leaving behind only white rings of flesh on rock. Updating this blog to WordPress. Please email me (harrowme AT yahoo.com) or comment if you experience any difficulties. Apologies for the falling plaster. Abigail wanted to have a birthday cake that would fit into her friend’s gluten-free diet. So we bought some namaste brand brownie and blondie mixes. 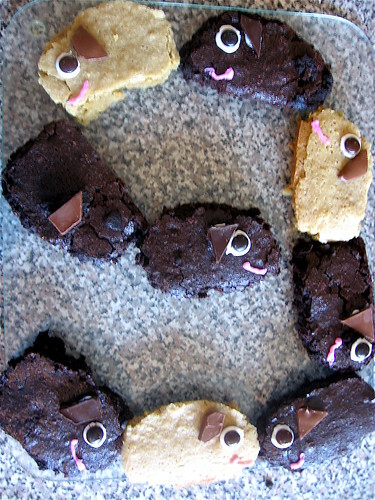 Using a template Abigail had made we cut guinea-pig-shaped brownies and blondies. 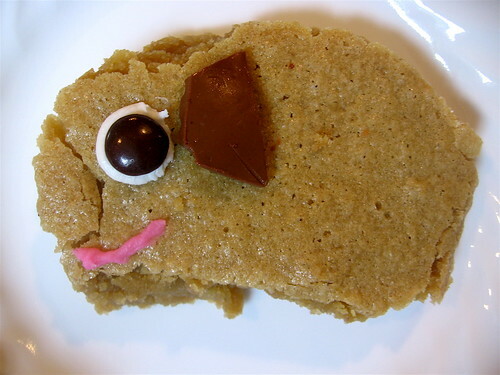 MnMs, frosting and chocolate turned the little cakes into cavies with eyes, ears and smiles. We were all smiling to see these nine cavies celebrating Abigail’s special day! I have completed more than 6 weeks of my 18 week marathon training plan and I’m beginning to realize how foolish I was. I don’t yet think I was foolish for running a marathon: no, I’m sure that will come later, during the race itself or afterwards. But I miscalculated the amount of time and energy training would require. The running itself is less than an hour a day, averaged over a week. Extra sleep though also factors into the equation. As well as some extra mental energy spent mapping out the distances, trying to find creative ways to run more than ten miles on this island for weeks in a row, and yes, Googling my questions and symptoms, aches and pains, to ensure my preparation and injury prevention. I told myself that running a marathon would only take a few months, and wouldn’t need that much time. I’m discovering though that this race is becoming a central focus of this spring season. I’m rearranging my schedule to fit in the distance runs and planning my summer around the marathon. I’m shopping and researching which items I should obtain before I get stuck in the middle of twenty-six miles as a blistered mess. It’s a delicate dance: in order to run such a race I need passion and perseverance, yet I also need to hold it with an open hand and keep my priorities in order for the other 23 hours of the day. I’d be a fool to think that at 6 out of 18 weeks, I am a third done with the training. The longest and hardest runs – and weeks – are yet to come. Only recently did I begin to mention to friends and acquaintances my maniac marathon plan. I was afraid to look foolish, especially since my attempt last fall ended before finishing five miles. Already I feel a bit of the blahs, the excitement of the early morning rising and running competing with a need for sleep, a sense of impatience and weariness setting in before I am out the door. It is this middle of the training, as in the middle of the marathon, that requires endurance. I’d be a fool though if I stopped now, when I can start to imagine how the finish line feels. Yesterday, I discovered my blog was broken. Entering my password only gave me error messages. Ted spent his Saturday morning researching options and hacking perl in a desperate attempt to rescue my blog. Hours later, as we left for Seattle, aggravated, exasperated and mystified, he reluctantly declared my blog dead. I think my husband was more upset than I was over my broken blog. My main concern was with retaining my eponymous url. If my blog was dead, it might be time to start a new one. Anything other than Movable Type certainly appeals to me, I confess. I didn’t want julieleung.com forever associated with a site I could not change or move. Ted though came home last night and began working on my blog again. I went to bed earlier than he did, as I often do. When I woke up, I found an email from him dated in the early morning hours, announcing that he had rescued my blog. Hurray! Jenny described the love languages in her family. I think that Ted wanted to fix my blog, not because it was a challenge to his skills or perhaps even insult to his pride, but because he loves me. He’s always supported and encouraged me in all my blogging endeavors and he understands how much of myself I’ve poured into that Movable Type installation on our server. Ted worked and hacked, eventually finding a solution that would allow me to use my blog again, out of his heart and passion for me. Perl is a love language.